Now we want to tell you about a new Ticket to the Stars slot. You will be able to play this slot on both desktop and mobile devices. This slot accepts bets from 0.25 to 100 euros and has a standard RTP rate of 96.52%. We can tell you right away that it is a beautiful looking creation with outstanding artwork and a fairly calm sound accompaniment. This slot visually has a sense of the era of 1960s, which mixed with futuristic elements. It is also worth mentioning the background of this slot. It ts an excellent work of art with a strong aesthetic appeal. There is also a silhouette of a couple, standing on a platform and holding hands. They are waiting to board a spaceship, which takes them on holidays thousands of light years away from home. What are the features of Ticket to the Stars? A new slot of the famous “Quickspin” company, which creates software for online-casinos, invites you to go on a space cruise in the Solar System, accompanied by a pilot, flight attendant and droid. It is a good company for such kind of trip. This is a high variance slot which comes bundled with several attractive features, such as “stacked jokers” and unlimited multiplier improvements which can potentially lead to winnnings, which are 10,000 times your bet. You will find mostly white, blue, green, pink and red gems, as well as more valuable symbols such as luggage, champagne bottles, butler droids, flight attendants and cool looking pilots during spinning the reels. The pilot gives you a 20-fold rate, being the most useful symbol. There is also a golden “wild” which has the same value as a pilot. The “wild” symbol is also the only symbol which looks completely folded on the reels. The main attraction of this cruise is a bonus. You will need to get 3, 4 or 5 bonus symbols to access it. They will allow you to start with 15, 20 or 25 free spins. It is interesting, that there is a “Unlimited multiplier”, which increases by 1 after every third win and also adds 2 extra spins to your total. “Swooping Reels” function is also applicable here. The combination of cascading symbols and growing multipliers gives a very profitable bonus with the possibility of winning almost 10,000 times your bet. 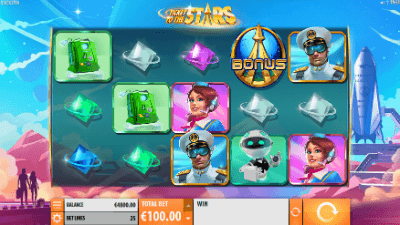 Ticket to the Stars is a fairly simple slot with an emphasis on the “free spins” and the “Unlimited Multiplier Meter”. As a result, you will come across a changeable slot machine, which can be a bit tedious in the main game, with neither the potential nor the attractive functions. This slot is undoubtedly fueled by good intentions, and in general, it is a good slot, although we must recognize, that there would be nothing else to attract your attention without a huge maximum gain that could tempt you.